Before going any further, I should stress that this post is intended only as a factual description of the shack at time of writing, in an attempt to help future visitors with some of the stuff we hadn’t known. This isn’t to criticise – the local amateurs have been wonderfully welcoming, and their willingness to open the station to others is very much appreciated. 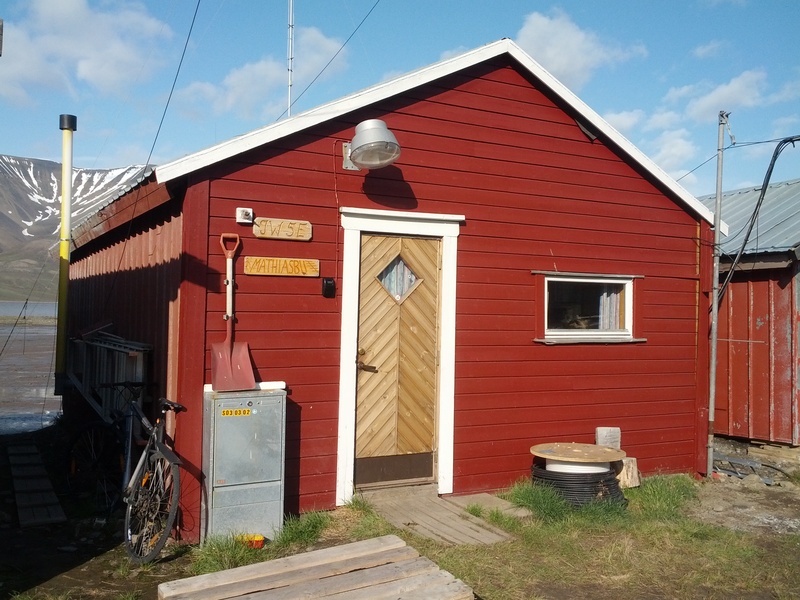 The shack is located on the shore of the fjord, just east of the main centre of Longyearbyen, but within easy walking distance of the main shopping street and the hotels in town. Polar bears have been known to come up the fjord, so there is a slight risk, but the shack is within the ‘no polar bear protection needed’ area of town. There’s a can of CS gas by the door in case of an unexpected visitor, but we’re told it would be technically illegal to use this (on the safety grounds that you’d be likely to spray yourself while panicking!). There’s good mobile phone coverage in Longyearbyen from both Telenor and NetCom. Although our mobile operators in the UK claimed they didn’t have roaming agreements with Svalbard, in practice it seems that if your operator has an agreement with the Norwegian operators listed above, roaming works. For Three UK customers, it looks as though this means Svalbard comes under the Feel At Home deal for Norway; I’ll update this information if we get an unexpectedly large phone bill on our return! Credit cards are widely accepted. I’d always carry some cash but we haven’t needed very much. On the whole, goods are quite expensive because of the cost of importing them to such a remote location. The cabin has kitchen with fridge, kettle, coffee machine and microwave, 2 bunk beds, sofas and a toilet. There’s heating (and in fact the shack has been at times too warm at night, at about 20c) but there’s no running water here. You can buy bottles of water in the amply-stocked supermarket, and we’ve also been filling bottles at the hotel where some of the other operators are staying. The toilet is a combustion toilet ‘for solid matter only’ (liquid deposits are left on the beach outside), which is easy to operate. It seems you have to guess whether you need a 40 minute or 70 minute burn for the size of the job, however! I’d recommend bringing some alcohol hand gel as there’s no water to wash your hands. The beds are comfortable, although right now someone using the upper bunk would have to share it with a Butternut vertical! Just bring a sleeping bag and you’re good to go. The shack currently comes equipped with a FT-1000MP Mark V and TS-870, with an interlocked six-pack antenna switch at each of the two operating positions. 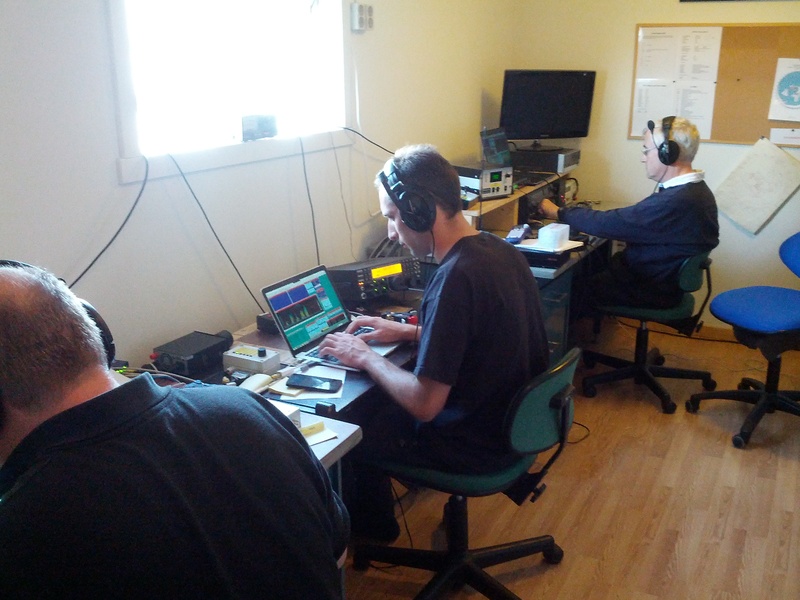 We’ve actually crammed four operating positions into the space and put the TS-870 to one side so we can fit the two K3s and IC-706Mk2G we brought with us. The FT-1000MP Mark V station has a MicroHam unit and computer. Each operating position has a 20A power supply. The shack used to have an amplifer but this has now been removed due to repeated damage by visiting groups, which is a pity but understandable. We’ve got a KPA500 with us. On the other hand, the shack now has Wifi, which was a nice surprise. This is supplied from Martin JW5ZLA’s home connection, via a Ubiquiti link on the tower. The shack also has a range of useful accessories, patch cables, etc neatly arranged on shelves. There’s also a limited supply of tools but as always, it’s probably safest to bring your own accessories! Power, by the way, is 220V 50Hz with European plugs. The state of antennas at the shack is a bit ropey, so you may want to bring plenty of wire and fibreglass poles. A climbing harness for the tower may also come in useful. We’ve installed a vertical dipole for 20m on the beach outside the shack for our operation. We haven’t used this as the bands haven’t been open. It’s very close vertically to the 15/17/20 Optibeam, however, so it may not be in tune. This is missing a director and is rather close to the 10/12m beam. SWR is OK on 17m but it is high on 15m (about 2:1) and very high on 20m (about 3:1 at the CW end and 2:1 at the SSB end). We’re using it as a 17m single band beam. Needs an ATU on 40m but works fine with a good SWR on 15m. We haven’t used this as the band isn’t open during the 24h sunlight in the summer. 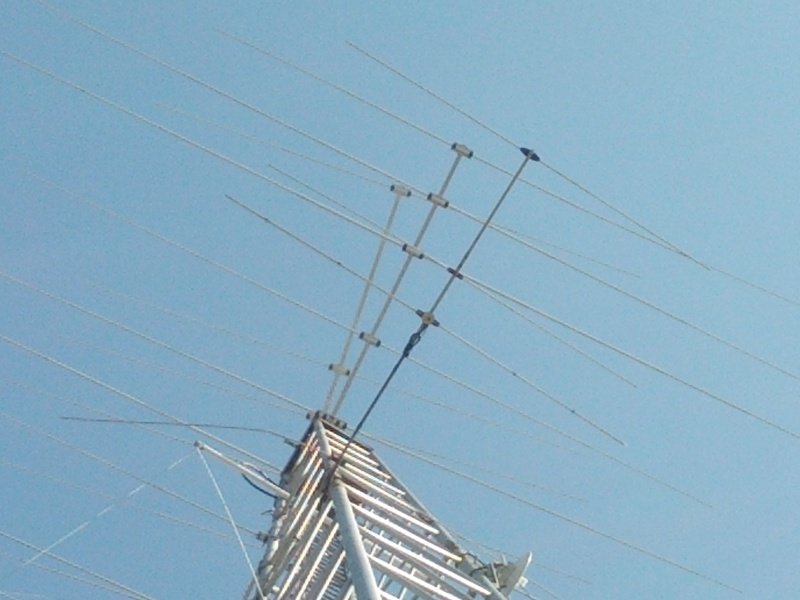 The reflector is badly bent and the coax doesn’t enter the shack. We’ve now bent the reflector back since the photo below. We’ve used this a bit on 40m but generally the sloper seems better. We haven’t used it on other bands as we noticed that RF gets into the shack (it’s literally just outside the window). The HF beams are on a ProSisTel rotator in the shack. There is a 2m repeater, JW9SRR, on a mountain out of town, which can be reached from a handheld outside in Longyearbyen. We’re told it’s not completely reliable at the moment but it seemed to open when we tested it. It’s on 145.600 with a -600Hz shift, 91.5Hz CTCSS. There’s also an APRS node on the European APRS frequency (144.8MHz) and there are simplex frequencies on the VHF bands used by the locals, which are listed in the shack.